With a brush I sketched and painted this small watercolor on the spot. It was a scene in an 100 year old art club. 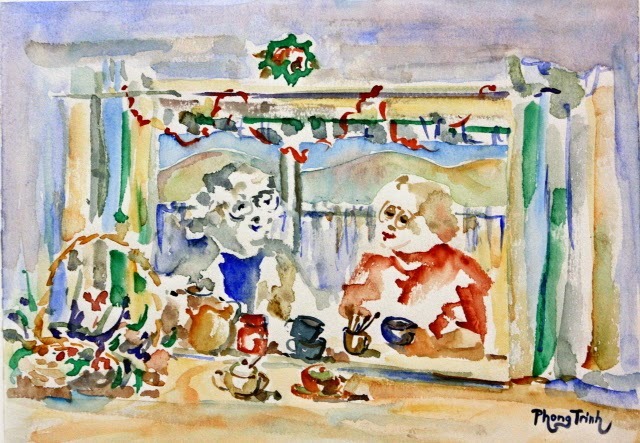 When the lady painters stopped and prepared a tea party, I grabbed an opportunity to record a lively and lovely scene. It took about 15 minutes. Because I thought I would not see such a beautiful setting again. I raced. My heart was pumping as my hand was moving real fast. When I finished, I was in a bit of shock. The face expression, the warm and liveliness I wished to have were there. This painting stayed as my favorite since. Nice party and very nice work!.